William F. Auffermann, MD, PhD has received the 2015 Editor’s Recognition Award with Special Distinction to honor his outstanding efforts as a reviewer for RADIOLOGY. This accolade is reserved for the top 10% of journal reviewers. Congratulations, Dr. Auffermann! 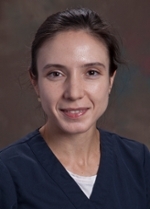 Aurora Marinescu, diagnostic radiology technologist at EUH, won the September Magnet Moment. At a celebration of her outstanding work, it was noted, “Aurora is one of those exceptional team members who makes everything go smoothly. She is ever the professional in all encounters whether it is with patients, family members, or another Emory employee. She is always quick and efficient, yet still takes the time to explain every single step to the patients she works with so they will know what to expect and won’t be scared. Aurora, your soft, kind words always comfort patients, which is so important on our unit. We sincerely appreciate your professionalism and courtesy, and are happy to have you as our Magnet Moment winner!" Douglas D. Robertson, MD, PhD has been appointed to the Orthopaedic Research Society/Journal of Orthopaedic Research Publications Advisory Board (formerly, Editorial Advisory Board). The Journal of Orthopaedic Research (JOR) is the premier source for advanced orthopaedic research in the world today. Congratulations on an esteemed appointment!